When the first box art images of Far Cry 3: Blood Dragon hit the web just over a week ago, it was a uniquely torturous moment. Being just hours away from April Fool’s Day, otherwise known as the single worst day to ever look at the Internet, Ubisoft’s potential ridiculous spinoff reimagining Far Cry 3 as a beautiful collaboration between 1986 John Carpenter and 1989 Capcom was almost certainly a hoax. Why would Ubisoft tempt the world with something so unabashedly awesome in theory only to take it away? Just look at the game’s website and its Geocities-circa-1996 style. When screenshots of the game leaked out, though, it seemed like Ubisoft wasn’t messing around. A week away from April Fool’s Day, it appears that Far Cry 3: Blood Dragon is not a hoax at all, nor some kind of beautiful fever dream. An official listing for the game has been posted to the Xbox Live Marketplace, with a release date of May 1. The listing also helps to illuminate just what the game actually is. For starters, it confirms that the game is not an expansion pack for Far Cry 3, but a standalone downloadable game. 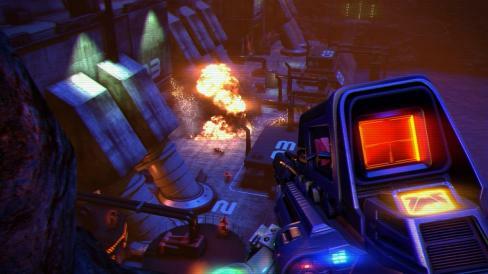 Like other Far Cry titles, Blood Dragon lets you freely explore an island. Instead of gun-toting mercenaries, however, Blood Dragon’s island is infested with cyborgs and laser-shooting dinosaurs. Calling back to those Capcom-style classics of the 1980s, Blood Dragon’s plot is a specific brand of vintage absurdity. You control Sergeant Rex Colt, a Cyber Commando trying to save his girlfriend while destroying as many evil cyborgs as possible. Voicing Colt is none other than Terminator and Aliens star Michael Biehn. Provided Blood Dragon is actually good, Biehn may redeem himself for taking part in making Aliens: Colonial Marines. Though the Xbox Live Marketplace seems to confirm the game’s existence once and for all, it doesn’t mean it’s an Xbox exclusive. As noted by NeoGAF user duckroll, the game’s ESRB rating lists it for PlayStation 3 and PC as well, and the game has been spotted in Steam’s registry.